June 6, 2016. I spent a week in June tromping through the water-logged landscape of northern Minnesota in pursuit of orchids. Orchids are elusive things, hiding out in the nooks and crannies of cedar swamps and bogs far from logging, roads, cows and corn. While I was out there I had plenty of time to think about the plants and animals surrounding me. I was immersed in them. Of course, there were the mosquitoes and black flies. After a dosing of DEET and making sure pant hems were tugged into boots, shirt sleeve buttons fastened, hat on snug, you could reasonable expect to not be eaten alive. Small yellow lady’s-slippers showing off at the beginning of June in northern Minnesota. Photo K. Chapman. Walking the soggy, boggy north woods, I had time to think about all the species around me, embedded as I was in their world and not one of human making. People have certainly affected that world. I saw, for instance, the scattered stumps of 600-year old white cedar trees cut one hundred years ago. They were still there, tokens of a natural world before the industrial age was overlaid on the fabric of nature. Some stumps were six feet across—very impressive in a backwards-looking way. I know it’s possible to cut timber in a fashion that not only gives us what we want, but lets the forest keep on doing what it would do—which is put on new, green matter every year, sustain a thousand species in good numbers, bring forth the young of every year (even mosquitoes which are pollinators of orchids and food for dragonflies), and do all sorts of wonderful things we don’t even notice. But of course, one hundred years ago, we had scant understanding of these things. The word ecology had only been invented a couple decades earlier. Surrounded by plants which spontaneously arose from the earth without human help, I also thought about their lineage, for some of them go back millions of years. A version of the lady’s slipper orchid I was looking for is thought to have originated over a million years ago. That is absolutely astounding. Our lineage, Homo sapiens subsp. sapiens, extends only 200 thousand years or so to east Africa, with a few thousand people wandering about the savannas there. Meanwhile, this orchid group has been on earth at least five times as long. Do we owe a little respect to lady’s-slippers for having made it this far? I’m reminded of two quotes, the first by Charles Darwin in answer to criticism by the Christian fundamentalist movement—then coalescing in the late 1800s in large part against Darwin’s idea of “descent by means of natural selection.” He said, “When I view all beings not as special creations, but as the lineal descendants of some few beings which lived long before the first bed of the Cambrian system was deposited, they seem to me to become ennobled.” By that I think he meant, he saw behind each species the planet’s inexorable life force and a genius of some kind. We can’t forget Darwin studied to become a minister before he embarked on his fateful voyage aboard the Beagle which resulted in his insights into the nature of speciation. A spiritual foundation was part of his mindset. In later years, though, Darwin was largely silent on the topic of God’s role in creation. And that’s a good thing. The separation of science and theology is a good thing. The other quote I think of is from an editorial in the Detroit News. The editorial from around 1974 or so was about the U.S. Endangered Species Act passed the year before. Of course, it spoke in opposition to the law. The argument it made was that no species cares about the demise of other species, and so why should we? The quote went something like, “In a dog-eat-dog world, paying attention to the welfare of other species is not an evolutionarily successful strategy for species survival.” Implicit here is that people will go extinct if they worry about and promote the persistence of other species. It seems to me that many people either still speak that sentiment out loud or unconsciously believe it. People generally don’t think we need other species—or rather, we only need some of them—our cows and chickens, our pigs to grow insulin and antibiotics, and one or two species of algae for those cutting-edge folks seeking to gasify high-fat algae into fuel. We also need, of course, trees to build things and aspen for wood pulp to make paper, and corn and soybeans, and fish in the oceans whose stocks we’re depleting at an alarming rate. We need all of those things, but they represent maybe a tenth of one percent of all the species out there—current count around ten million species. The estimated rate of loss over the next 50 to 100 years is that a quarter to one half of those will disappear. That’s a remarkable percentage of all living species—a change equivalent to the other five great extinction events over the last five hundred million years, including the most recent one that took out the dinosaurs about 66 million years ago. A mini-spasm occurred most recently when humans dispersed across the globe, beginning about 45 thousand years ago. This was the Pleistocene die-off, with American camels, giant ground sloths, massive birds, mammoths and mastodons among its victims. 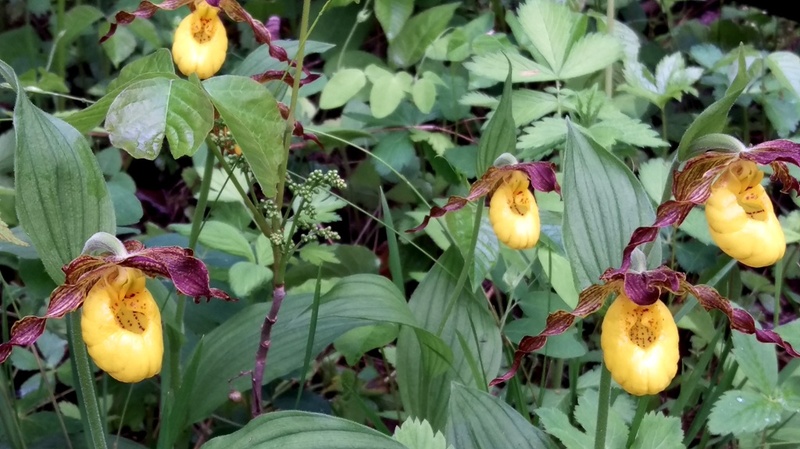 So…as I walked through alder swamps, black spruce bogs, aspen woodlands, filled with yellow orchids—the lady’s-slippers with the little bowls, each like a ridged goblet—and I chanced upon one of those ancient orchids, these thoughts occurred. I don’t know what to do with them—how do you bring into popular culture and everyday consciousness the idea of keeping all the species? Some say that economics is part of the answer: building an economic system around retaining species, rather than plowing ahead devil-may-care and consequences-be-damned, to use some old expressions. Alternately, we could simply agree to co-exist with the other ten million species on the planet. Are we big enough for that? Is the human family smart and generous enough to start thinking about other species, all of them?